Last semester, Kent State doctoral student Shelley Blundell spent each Thursday at the CHP working with the Ludy T. Benjamin, Jr. Popular Psychology Magazine collection. Her work involved creating a long-term preservation and digitization plan for the collection. Shelley also got a chance to gain more insight on the collection by interviewing Dr. Benjamin. Dr. Ludy T. Benjamin, Jr. is a collector. In fact, he prizes collecting so much that he believes it may be some kind of gene in his biological make-up. Beginning with the standard “collection” fare of coins and stamps as a youngster, he later moved on to items germane to the field of psychology, where he made his academic and professional home. In particular, as he was concluding his graduate studies in the 1970s, he became a collector of old psychology books, and spent a great amount of time scouring used book stores for them. It was in these same stores that he began to amass what would later become the amazing (and purely accidental, he related) “Ludy T. Benjamin, Jr. Popular Psychology Magazine collection,” which is now housed at the Center for the History of Psychology. The collection contains around 1,590 items at present and keeps growing, as Ben continues to collect magazines to later add to the collection. Some magazines are older (as old as the late 1800s), some are “wiser” in terms of the content discussed while some are “fluffier,” and others create a great understanding for the ebb and flow of the societal tide during the 20th Century. Ben believes that the biggest value of the collection lies in its function as a cultural snapshot of U.S. social history, particularly during the 1920s and the 1930s (when popular psychology became a very—well—popular topic). Many of the magazines in the collection are visually and intellectually appealing and cover content as diverse as parenting, “fringe” sexual behavior, depression, aging, grief, stress, and relationships. Titles include Mesmeric Magazine, Success: The New Psychology Magazine, and The Psychogram: A Magazine of Christian and Practical Psychology. 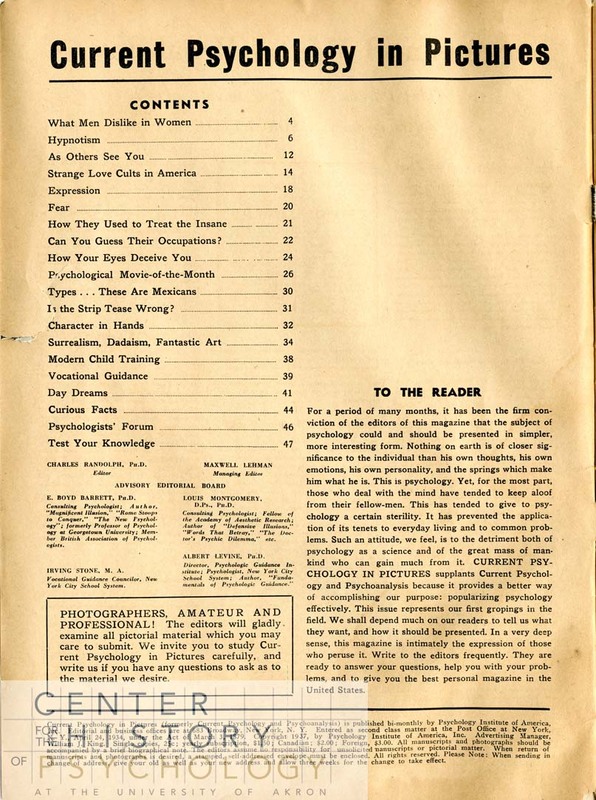 Cover of a 1937 issue of Current Psychology in Pictures. Table of Contents, Current Psychology in Pictures. 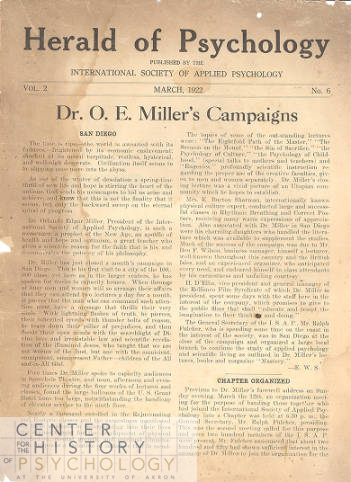 Article in a 1922 issue of Herald of Psychology. I learned a great deal about popular psychology and U.S. culture through my Thursdays with Ben, and I’m sure you will find something of interest and/or value in the collection as well. Listen to an excerpt from my interview with Ben here. Browse titles from the collection here.